A New York startup is aiming to let consumers have their selfie — and eat it too. Selffee is a photo booth that prints photos on cookies, cupcakes, and coffee, live and in-person. The new company has been running pop-up locations throughout New York for the past six months, and now Selffee is looking to open its first permanent location with the help of crowdfunding. Selffee’s Indiegogo campaign is already past the halfway point to its $30,000 goal with 10 days to go. Unlike a traditional photo printed on sheet cake, Selffee uses FDA-approved food dyes to print photos on baked goods and drinks on-site in just a few minutes. A single item takes three minutes to print, but the process speeds up for larger orders — a dozen cookies takes 12 minutes. Selffee also says that while traditional face-on-a-cake printing alters the taste and texture of the frosting, Selffee’s edible inks do not. Printing photos on food, and even on coffee foam, isn’t a completely new concept, but Selffee has taken that idea and combined it with the photo booth craze, offering sugar cookies, vanilla and buttercream cupcakes, and iced coffee in current pop-up booths. According to the startup, 95 percent of attendees at its first several events have taken a selfie with their Selffee and shared it on social media. That cool factor, Selffee says, leads to more engagement and reach on social media for companies adding the photo booth to an event. While the Indiegogo campaign funds will help build a New York storefront, Selffee says the location will also serve as a hub to fulfill online orders. Cookies will be shipped throughout the U.S. so non-New Yorkers can start taking a bite out of their selfies as well. 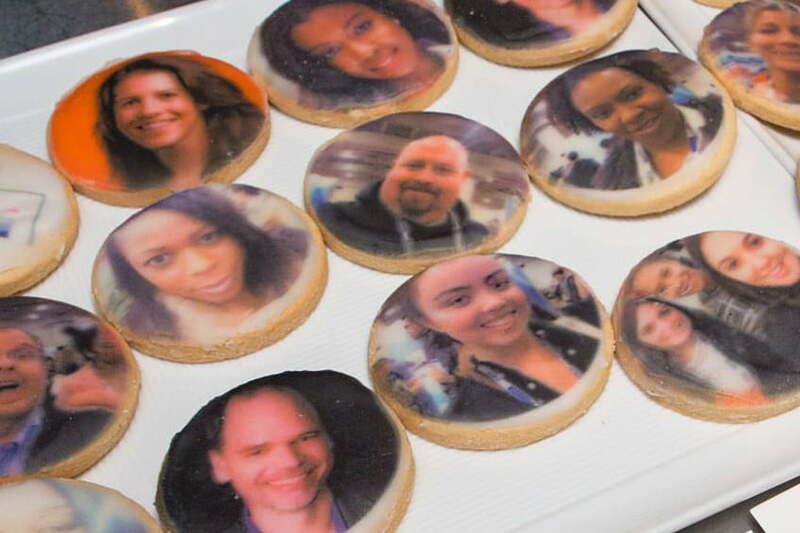 Consumers eager to get their face on a cookie can pledge $50 to receive a dozen cookies, which will be delivered in January if the Indiegogo campaign is successful, or the more ambitious can pledge $1,100 to have a Selffee booth arrive at their next New York-area event.